I thought it might be really interesting (convicting?) 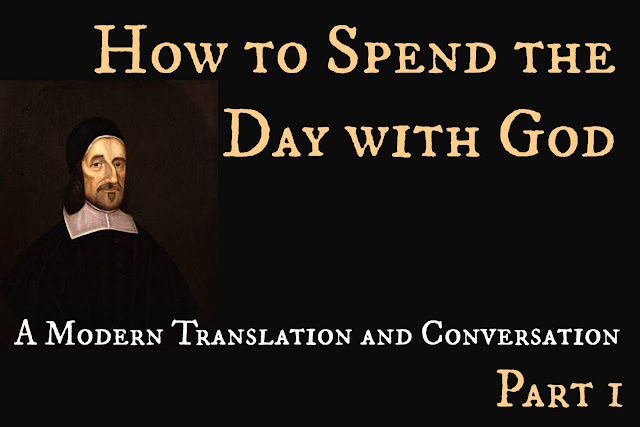 to do a modern translation and discussion of a essay by Puritan pastor and theologian Richard Baxter. Baxter lived and wrote in the 1600's and was one of the most prolific theological writers of his time. I've only read a few short pieces of his work, but was assigned to read one for a class and it surprised me with its practicality almost 400 years after it was written. Four Hundred Years! Really man's struggle, MY struggle, is nothing new. We just have new ways of adding to it. I also want this to be a discussion. Let's talk about what you agree with, what you disagree with, and what hits just a little too close to home. And let's not just talk about it, let's put some action into the areas we are convicted of and do something. I'll put Baxter's words first, then my translation below. Then let's walk through them together. Baxter's Introduction: It somewhat tends to make a holy life more easy to us, when we know the ordinary course and method of our duties, and everything falls into its proper place; as it helps the farmer or tradesman to know the ordinary course of his work, that he need not go out of it, unless in extraordinary cases. Therefore I shall here give you some brief directions for the holy spending of every day. My Introduction: A life pleasing to God is easier to live when we are not overwhelmed with chaos and distractions. If we have a basic routine for our days and know the usual things we should be doing at certain times of the day, everything just goes smoother. True, there will be days where nothing goes how we want, but having a plan helps us recover quickly and move on better tomorrow. Following are a few thoughts on how to turn the chaos into calm and do this Christian walk a little better each day. Baxter: Direction 1. Proportion the time of your sleep aright, (if it be in your power,) that you waste not your precious morning hours sluggishly in your bed. Let the time of your sleep be rationally fitted to your health and labor, and not sensually to your slothful pleasure. The morning hours are the most precious of all the day, for all our duties; especially those who are scanted of time, must take it then for prayer, if possible, lest they have none at all. Direction 1: Be intentional with your sleep. Don't waste your very few morning hours in bed any more than you need to (NEED, not want). Figure out how much sleep your body needs to function well and stick with that routinely. Don't lay in bed in the morning because it feels good, these few quiet minutes are the only few you'll have when someone doesn't need you. If you are especially harried in the mornings and don't have time to pray, its hiding right here... after the alarm, before the snooze. I really appreciated that Baxter doesn't lay out a specified number of hours of sleep. Our days and our bodies and our seasons of life are all different. I like that he took that into account. Not a one-size-fits-all kind of approach. "..and not sensually to your slothful pleasure." Ouch, Richard. Ouch. Low blow. But, I do see his point. If I want to get better at this living life to the fullest thing, I've got to make the moments count, because those add up to my days. That doesn't mean I'm legalistic about my hours of waking and sleeping, but that I'm thoughtful, intentional, and purposeful. I'm starting to realize that the more I live life on default mode, the harder it is to do anything of meaning. What do I need to do in light of this? Well, for me, with teen boys that sleep in until noon unless they have to get up, sleeping in is a very real temptation. But, I've been waking up early for so many years that it is a habit now. So my struggle isn't so much with the getting out of bed part, but more with the prayer part he mentions at the end. I get up okay, but not until I've hit snooze too many times, so I will move my alarm clock out of arm's reach. I will put my feet on the ground and just get up the first time it rings. Because, really, that snooze is just too tempting to give in to my slothful pleasure... and really, are those 9 or 18 minutes worth it? It is actually pretty amazing to see Baxter's wisdom from 400 years ago, turn up in a Huffington Post article. Now it's your turn. What do you think? What did you like? What hit home? What are you going to do? I'd love to discuss with you in the comments below! I think that what hit me most in the introduction was how we should focus our time and attention on God and not so much on our work. For those of us who work outside of the home, it is easy to get focused and transfixed on our goals for work, our productivity quotas, our ambitions, when we should be making God and growth in Him our focus, our ambition. As for the second part, sleep, that seems to be a big theme for a lot of challenges and blogs this month. I have always had problems with sleep until I hit peri-menopausal, now I sleep like a baby and relish in that wonderful deep and full-night's sleep that leaves me refreshed and not groggy in the mornings. I agree completely about work focus! So easy to lose sight of what we really need to be doing with our time and life! Hey Kari! What a great idea to blog on Richard Baxter's writing and "translate" them into modern-day application. It's amazing how little has changed in 400 years. I thought his words were spot-on, and I felt convicted that it really came down to my priorities in the morning. When I turn off my alarm, I can groggily scroll Facebook, or I can put my feet on the floor like you said and give God my first few moments in prayer. Can't wait to read the next part of what he has to say! I know! And each of the following points he makes just keep getting better and give me LOTS to think on! Yes, I so hear you on the facebook scrolling. Ugh! Very thought provoking - and a big "ouch" about hitting the snooze button! right? Ouch indeed. I did move my alarm clock last night and it definitely got me out of bed with no snooze! On the other spectrum, I am semi-retired and a widow. It is very easy to sleep in on the days I do not work...what reason do I actually have to get up? But this was interesting, because my thoughts should be and can be more focused on God than on anything else. I could quite possibly spend the entire day with Him uninterrupted. I find the idea of spending more time with Him on my mind and less on my thoughts of loneliness or feelings of my time to serve is over very fascinating. Time for me to wake up and spend time in my Father's presence and focus on leading a full life. Thanks. This was literally a wake up call for me. Amen. It was for me too. I love that anyone in any stage of life can learn from his words of over 400 years ago. That still just blows me away. So glad you read and will apply them! Kari, I enjoy your blog. Although I don't have much time to share ideas with everybody, I wanted you to know that I am quietly participating. I have an interesting twist on this idea about sleeping in. I work at night and sleep during the day. It is hard to know when enough sleep is enough. Catching up on lost sleep is never as satisfying as getting it right in the first place. Four hundred years ago, the sun ruled day/night cycles. Today we have electricity making 24 hour daylight cycles and shift jobs probable for many people. I am looking at my productive times as opposed to my rest times and I am trying to find a better balance. Wasting time is an important issue no matter what your schedule. I have started by using a planner and To Do lists. It is helping to be more organized. So I am adding scripture study and my Time with God to my list. Thanks everyone for your ideas and input. Oh, Ben Franklin was very big on not wasting time. I bet he read Richard Baxter's writings. Yes, so true. 400 years ago was so different than today, which is why I went into this assignment thinking that so much would not apply to us today... and was shocked at just how timely it all is. In class we're reading Ben Franklin's autobiography next, so I'm sure that will pop up here too! Great work on your planner and to do lists! I pray your time with the Word and God will increase too! This has been convicting me lately, so it's very timely! I'm starting to get more sleep now that my youngest is almost 19months old. I vascilate between feeling like I need to get up earlier to spend time in prayer to feeling like I can sleep in to catch up on three years of limited sleep (my second child is a TERRIBLE sleeper and my third only a smidge better). I'm already up early three mornings a week to run before my husband leaves for work, so I'm committing to getting up early the other four mornings to that I can pray for an extended period. I'm starting at 30 minutes and working up to an hour! Oh, I had a terrible sleeper in my second child too. It made for a really REALLY rough season of life and a lot of bad times in our family and my life. Everything seems to shut down when there's a lack of sleep. I'll be praying that you cling to God during these times and get deep rest even when it's short. Awesome job on extended prayer! I'm really trying to improve there too! For me, it is making sure I get my prayer time done first thing in the morning, otherwise things pop up and its too easy to , to be too busy, to put it thinking I will do it before bed only to find I'm too tirtiredprwy adequately. Time to make a morningtime prayer commitment! Yup. You just described almost every morning around here! Thank you for this! I have been inconsistently waking up early in the morning for prayer and devotions and this made me very motivated! It has been on my mind to possibly start a blog and this encouraged me to do so. Check it out if you like, I mentioned your post, I hope that's ok! You're off to a GREAT start!! Here's to the next 30 days! Or 27!! The nerd in me loves these 400 yr old texts! LOL I, too, am convicted. Day #3 of no snooze because the clock is too far away was successful! I have been trying to figure that out too. I think it's tucked into some of his larger volumes, but I'll ask my teacher and see if I can find out and let you know. I think the part that got to me was that it is easier to live a life that is pleasing to God when we know what to expect out of our day. It is a lot harder to trust God when we are in the misdt of trials. Nothing about our day seems routine then. For me (also w/2 teenage boys) I get up before the whole house and have quiet time with the Lord everyday! I have found when I don't my days usually end up in chaos. It is also eaiser to trust God during those trials because I have daily spent time in His word and seen how He has been faithful to me and others in the Bible. Thank you for the modern day translation too! it makes it a lot easier to understand. I am also intrested to know where the writings came from. Amen. So true! I haven't found exactly which volume this came from, but will keep looking into it. Thanks! A few months ago, you would have found me leading the get up early bandwagon but something changed on my body clock lately and it is now torture to get up in the morning and I am wide awake until almost midnight after a couple years of waking easily in the morning and drifting off effortlessly before 10pm. I have decided not to stress and struggle with this because we have a choice in our morning routine as homeschoolers. If this is what my body is doing right now, I choose to work with it rather than fight it. Not all "sleeping in" is sloth. I am making the adjustment to do a lot of what I used to do in the morning before bed instead. Trying to force myself asleep is not fruitful. Instead, I can plan out the next day, reflect on that day, pray, read my Bible, do a load of laundry and put away the dishes from the dishwasher. There is nothing inherently sacred about the morning. I think sometimes night owls are made to feel a little inferior because they are slow to get started. Just like I recognize that my teens' body clocks are a little wonky, when mine is on it's own program, I need to go with the flow. I totally understand, and know what you're talking about. I know in our modern world that our nights and days are not like they were for the puritans, and everyone's life is different, and hoped that I made that clear above. I have many friends who are night owls and do great. I think the thing I liked the most is that the issue isn't about getting the rest we need, but laying in bed to EXCESS, and only you can judge that. Kari - thanks for sharing this! I am already looking forward to more. For myself, I have found in my life that when God has gotten me to the place of understanding how much I truly need Him, how much His words are truly life, then getting up in the morning is easy. I would no sooner start my day without time in His Word than I would start my day without caffeinated coffee! =) Of course, having a great method (supplied by you & this blog) has made that yet easier. Also, one thing that I have learned in recent months is to bring my "to do" list to my quiet time. I am able to jot down things I need to do & that keeps me from being overly distracted during my reading & prayer time. THEN - and this is the kicker - I can also take time to lay my plans before the Lord, give up my day to Him, and ask Him to guide my plans, decisions, and to-dos. This process has been wonderful in acknowledging before the Lord how little true control I have over my day (and confessing my pride that I think I do have control); has allowed me to be patient and kind to people who seem to be purposely preventing me from accomplishing a.n.y.t.h.i.n.g for the day; and has given me freedom to accept people and circumstances that were not on my list. Amen! In fact, I have a blog post half written from months ago about how my to-do list forms pretty automatically when I pray, because EVERYTHING under the sun that I've forgotten to do comes to my mind to distract me during prayer. So I keep a notebook nearby and by the time I'm done, it's pretty much formed for me! And I love that about laying the plans and to-do's before Him. It helps me to see my priorities better when I lay that list out before Him. For sure! Thanks for sharing!